If you, like many other couples, are taking care of your own wedding planning, your job is to plan everything from the way you will enter the ceremony to the last moment when you and your new husband/wife drive off into the sunset. Over the course of time, many things have been used to send the happy couple off to their honeymoon, including rice, confetti, and streamers that leave a big mess behind, noisemakers that can be irritating, and more recently, wedding sparklers. According to historians, the Chinese invented firecrackers way back in the sixth century. Sometime around a hundred years later, sparklers were invented. Today, you can find sparklers for sale for the 4th of July and New Year's Eve celebrations. Special wedding sparklers offer a romantic way to shower the happy couple with golden sparks when the guests line up outside of the reception facility to send the couple on their way. One of the biggest advantages of wedding sparklers besides the lack of mess is that they can be used any time of the year. Rice and paper are not a good choice for weddings held during the rainy or winter months as the weather tends to ruin the effects. Nothing stops a well-made sparkler from giving off its cheerful shower of golden sparks, not even a little bit of rain. The glow created by a tunnel of sparklers is sure to reflect off the beading on your wedding gown adding to the romance and mystique of your special day. What better way to show off the diamonds on your wedding ring than in the firelight of a long burning wedding sparkler? Depending on the length of the sparklers for sale you choose, they can burn for up to 3.5 minutes. This should be more than enough time for the bride and groom to walk from the reception hall to their car and stop for congratulations along the way. 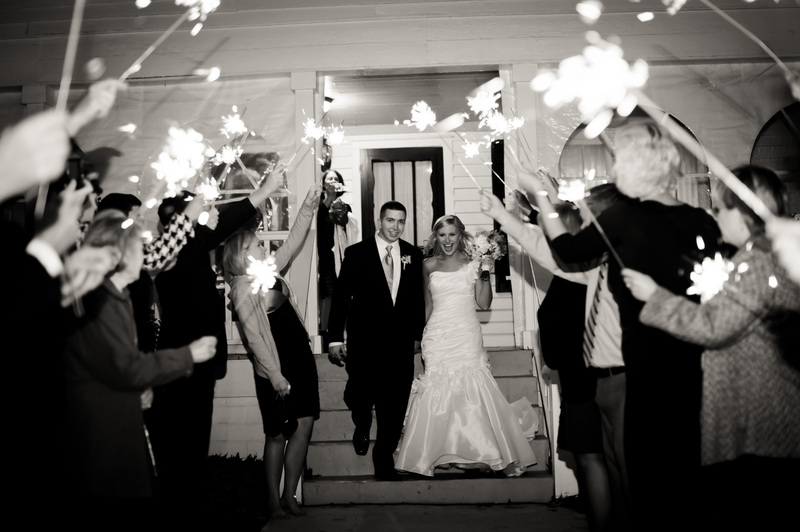 There are several ways you can enhance the romantic nature of your wedding with sparklers. But most people tend to use them in much the same way as rice or confetti has been used in the past. Gather up all of your guests and let them all light their sparklers. Then you can have them stand facing each other in two lines, holding their sparklers at arm's length forming a tunnel. The married couple can then walk through this tunnel and enjoy a very magical send-off. Wedding sparklers come in a wide range of sizes, ranging from 10 inches long that burn for approximately 45 seconds, all the way up to 36 inches long that burn for 3.5 minutes. Along with these, we also offer heart shaped sparklers for sale that add an incredibly romantic touch to your special day. Our sparklers are sold in boxes of 52, 100, 152, and 200 to ensure you have plenty for all of your guests. Heart shaped sparklers come in boxes of 36 or in a full case of 216 and come in traditional gray or red. Light up the end of your wedding in style with our sparklers and create a wedding exit to remember.